Mentallo & the Fixer ~ Music from the Eather (Alfa Matrix). Today’s industrial music sounds much as it did a decade ago, undeniably powerful but no longer original. This album could change all that. The hugeness of the sound – crisp production, fluctuating beats and interlocking matrixes – blows away all rhythmic competition. The album is offered in a couple different versions, the best being the limited 3-disc set. For anyone invested in the future of IDM, this is the year’s most essential release. Anoice ~ The Black Rain (Ricco). The album is darkness and light, despair and hope, enigma and interpretation: a reflection of a nation emerging from tragedy. The title refers to the black rain of nuclear fallout, which descended on Japan during the Second World War and fell again in 2011 after the earthquake and the reactor meltdown. On the front cover, a woman weeps, but on the back, she rises, head upright, as if to say, I no longer need to be protected from the things of this world. She has wept the world’s tears and emerged scathed, yet intact: irrevocably altered, irrepressibly resolute, the mirror of an embattled nation that cannot, will not allow its character to be determined by destiny alone. 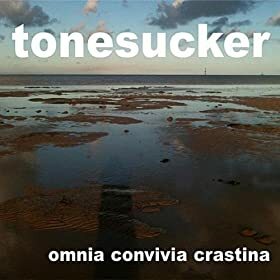 Tonesucker ~ Omnia Convivia Crastina (Onoma). The industrial revolution brought these sounds into the public consciousness, and for most of history they have seemed unwanted. This is noise, but noise that has been tamed, sculpted, shaped and made desirable: the potentially ugly made potentially beautiful, even glorious, a wash of mechanized sounds with aquatic timbres, imitations of telephones and emergency vehicles, bells and wires and factories forming an unlikely harmonious choir. From tap dancing to trains, motorcycles to marching bands, this eclectic mash-up really packs it in. Samples scoot by like seagulls in a hurricane, and the tracks blend to form a single 77-minute mix. Some will call it generous, others overstuffed. But those who love variety will be fascinated. There’s not a nook or cranny anywhere that doesn’t have something stuck in it, like a sonic curiousity shoppe waiting to be browsed. Plinth ~ Collected Machine Music (Time Released Sound). Collected Machine Music may be the best music box album ever made. The limited edition contains a miniature music box and a punch strip, unique to its owner. This sort of music is timeless: a reclaimed relic that travels across the centuries with nary a dent. Yet Plinth is not trying to fool the ear. While the melodies could have been recorded a hundred years ago, their scratched patina marks them as memories of events that never occurred. Craig Vear ~ ESK (3leaves). In order to capture these sounds, Vear traveled up the North Yorkshire coast, beginning at the harbour and ending at the Esklets. He then merged and re-arranged his recordings so that the piece would reflect a river flowing to the sea. But listening is not entirely like walking downriver; instead, it’s like pulling over every once in a while to take in the sonic field. 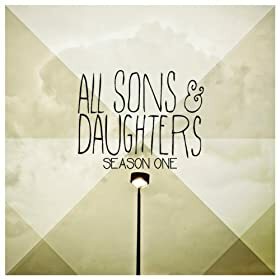 All Sons and Daughters ~ Season 1 (Integrity Music). Every song is written in honor of specific people or events in this duo’s Tennessee church, giving Season 1 a sense of authenticity and grace. It’s the best worship album of the year, and the best Christian album in recent memory. The songs work because they’ve been lived, providing hope because they were written for those in tears. Simon Scott ~ Below Sea Level (12k). The history and spirit of the British Fens are brought to life in this elaborate combination of hardbound book, CD and live bonus download. As Simon Scott reconnects with the great outdoors, he grows increasingly concerned with the preservation of sound environments. For many listeners unfamiliar with the issue, this album may represent the inception of an urgent idea. Below Sea Level is much more than simply music and sound; it’s a quiet revolution. Matteo Uggeri | Luca Mauri | Francesco Giannico ~ Pagetos (Boring Machines). Five years ago, Erimos (desert) and Nefelodhis (cloudy) were the first entires in the Between the Elements Quadrilogy. Kapnos (smoke) followed a couple years later, and finally Pagetos (morning frost) in 2012. The tracks flow together like winter flows into spring, chronicling the inevitable tumble into warmth and the awakening of the seeds. Now that the quadrilogy is complete, we can appreciate the overall tapestry. 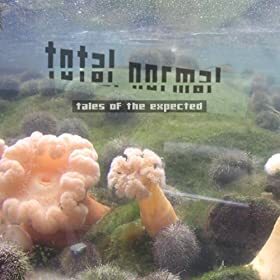 Total Normal ~ Tales of the Expected (Momental Records). Under normal conditions, one might prefer rock and pop to exotica and spoken word, but at this sonic boutique, every toy rests on the same shelf: a cowboy hat, a candy casket, a ray gun, random dialogue, stray beats, melodic scraps. The purchases head into the shopping cart, where they are jostled, shuffled, and bruised; then home, where they are sorted and smoothed. Each song is its own little mix ~ it’s not a mash-up, it’s a meld. “Requiem for the Static King” Directed by Christopher Hewitt, music by A Winged Victory for the Sullen. “Postcard from 1952” Directed by Annie Gunn, music by Explosions in the Sky. “Ekki múkk” Directed by Nick Abrahams, music by Sigur Rós. “The Rip Tide” Directed by Houmam Abdallah, music by Beirut. “The Middle” Directed by Morgan Beringer, music by Matthew Dear. “Bounce Bounce” Directed by Hayley Morris, music by Hilary Hahn & Hauschka. “Thistle” by Martin Allais, music by Hundred Waters. “Jammed” Directed by M-I-E, music by Dan & John at Meanred. “Putty Boy Strut” Directed by Cyriak, music by Flying Lotus. “Shift” Directed by Max Hattler, music by David Kamp. Bernie Krause, The Great Animal Orchestra: Finding the Origins of Music in the World’s Wild Places. James Balog & Terry Tempest Williams, Ice: Portraits of Vanishing Glaciers. R. Klanten & H. Hellige,Patrick Rothfuss, Little Big Books: Illustrations for Children’s Picture Books. Alan Lightman, Mr. g: a novel about the creation. Alan Light, The Holy or the Broken: Leonard Cohen, Jeff Buckley and the Unlikely Ascent of “Hallelujah”. Adam Brent Houghtaling, This Will End in Tears: The Miserabilist Guide to Music. Lynn Sherr, Swim: Why We Love the Water. Peter Heller, The Dog Stars (novel). Jen Campbell, Weird Things Customers Say in Bookstores. David Bynre, How Music Works. Be the first to comment on "Richard Allen Poop ’12"